Whether you fancy a feline flick, a smoky smudge or just understated definition, MAC’s got it all – liquid, gel, pencil or kohl. Perhaps as a result of the ‘Duchess-effect’ creating a wave of women attempting to emulate the understated elegance of Kate Middleton, black eyeliner has quickly become the hottest beauty trend of the season. Kate’s iconic kohl-rimmed look once slated as ‘out-dated’, ‘unflattering’ and ‘ageing’ is all over the SS12 runways now, showcased by top-end designers like Alexander Wang, Jonathan Saunders and Emilio Pucci. MAC is as always a favourite choice with the fashion houses, with Marios Schwab using MAC Eye Kohl in ‘Smolder’ to create a soft ‘fuzzy feline’ look, and Jonathon Saunders using MAC Fluidline in ‘Blacktrack’ for a dramatic 50s flick with sweeping wings. 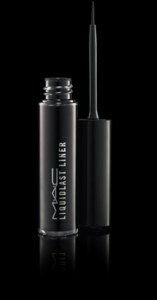 To explore MAC’s impressive range of black eyeliners yourself, visit MAC Cosmetics and find your look.